My knowledge of J-Rock is close to zero. And even though JF Manila Library has quite a selection of J-Rock and J-Pop music, my exposure to Japanese music is mostly to traditional music or contemporary music using traditional instruments (i.e. taiko, shamisen and koto). When news came about that our office will going J-Rock this Nihongo Fiesta, I knew I had a lot of catching up to do (I didn’t know J-Rock and I clearly have no idea who Uchusentai: NOIZ was or what visual kei rock group looks like). Nihongo Fiesta (fiesta is a Spanish word for feast or party) is one of JF Manila’s yearly events that attract thousands of Filipinos of all ages to celebrate and participate in a weekend of Japanese language and art through activities such as speech contests, quiz bees and concerts. Since the 2013 Nihongo Fiesta was going to highlight the concert of Uchusentai, our office secretary was kind enough to email me the link to the group’s video “Narda” to educate me with the group’s music and over-all look. At first glance, the group reminded me of the American rock band KISS because of the make-up and the flamboyant outfits. Apparently this is what the Japanese movement “visual kei” is: the use of make-up, elaborate hairstyles and flamboyant costumes. And Uchusentai is one the popular visual kei bands of Japan. 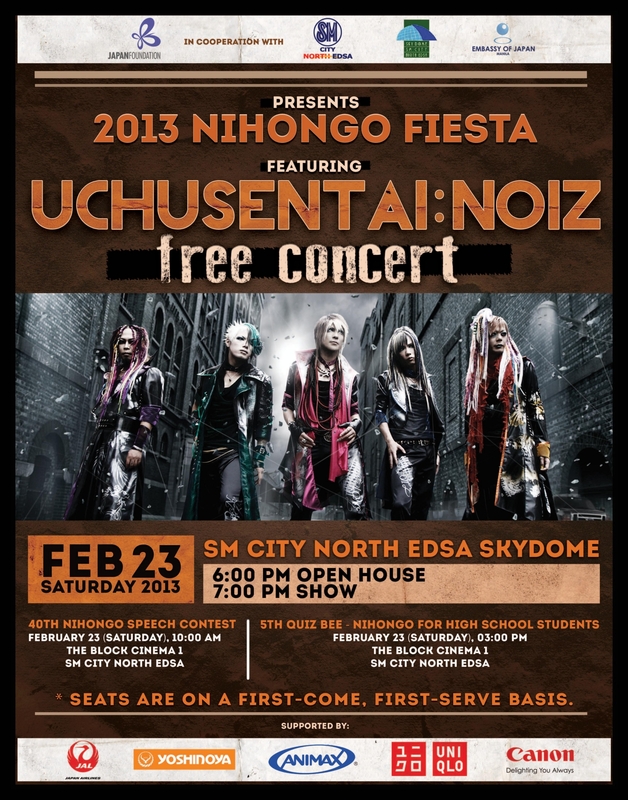 The first video of NOIZ that I saw was their video the Filipino rock song “Narda”. I was surprised, their version was pretty good. No wonder it became a big hit with the Filipinos. http://www.youtube.com/watch?v=lde76arEmGA. Their music style is not what I expected; I thought I would hear be a lot of screaming/noise (in Japanese of course) but their music is rather pleasant. Not the sound I was imaging based on their look. With only 2 weeks to go before the Uchusentai: NOIZ concert, our office is finalizing all the logistical requirements for the event. I have been updating my checklist little by little at the same time listening to their music and watching their videos from last year’s “Best of Anime” to better prepare myself for the concert. Now that I have an idea on what they look like and what they sound, I think I am ready for the concert. The only thing I need to do now is prepare for the big crowd… that I think will be Lesson 3: The Crowd.